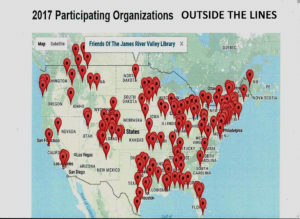 JAMESTOWN, N.D. (NewsDakota.com) – The James River Valley Library System (JRVLS) will be one of 250 libraries worldwide to participate in Outside the Lines (OTL), a campaign to raise awareness on the importance of libraries to their communities. JRVLS is the only library in North Dakota participating in the worldwide celebration, held between September 10th and September 16th. JRVLS Development Director Bill Kennedy says they will be looking for stories from area individuals that share their experiences with their local library. Kennedy says each library participating in the week long, worldwide project will do a special thing specific to their area. The Friends of the James River Valley Library System are looking for 100 stories from adults, kids and anyone else who wants to participate. The stories will then be published on their blog and some will even be posted on NewsDakota.com. They hope to have all their stories before September 16th. You can send your stories to billkennedy0@gmail.com or submit them online at www.friendsofjrvl.org and click on “JRVLS is Outside the Lines”. They ask that stories are anywhere from 300 to 800 words. Below are some story examples and a map of all participating libraries in the US. JRVLS is one of over 200 libraries worldwide participating in the week long Outside the Lines celebration.